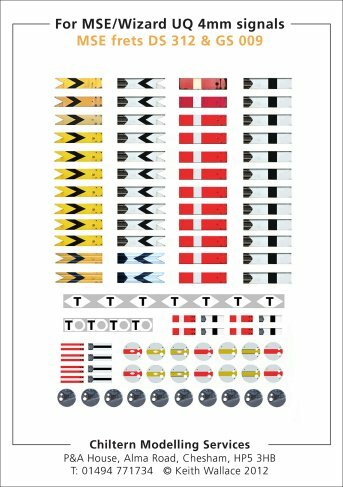 Here are set of waterslide transfers to customise your MSE/Wizard and Scalelink brass signal arms etches in 4mm scale (suitable for signals being used with OO, EM and P4 track gauges). They are invaluable for anyone having difficulty creating the chevrons on distant signals, as MSE have no guide etches, and the Scalelink ones are sometimes difficult to see! Check out how other modellers have used these transfers in the Signal Gallery. The sheet contains 12 Home signals and backs, together with 12 distant signals. Two of the distants are the Anderson corrugated type used in the early years of the LMS. There is also a pair of the smaller shunting arms, and the similar sized calling on signals. In addition there is a full set of disc signals: home, distant and distant with black horizontal lines. In addition there are also backs for these signals. This consists of a metal plate to which the spindle is attached, and the signal itself bolted to the front. There are two ways of adding the back - either cut a whole in the centre and feed it down the rod you have soldered to the MSE signal plate, or solder the rod to the plate, and cut the transfer in half, again with a semi-circle cut in the centre to fit round any solder. 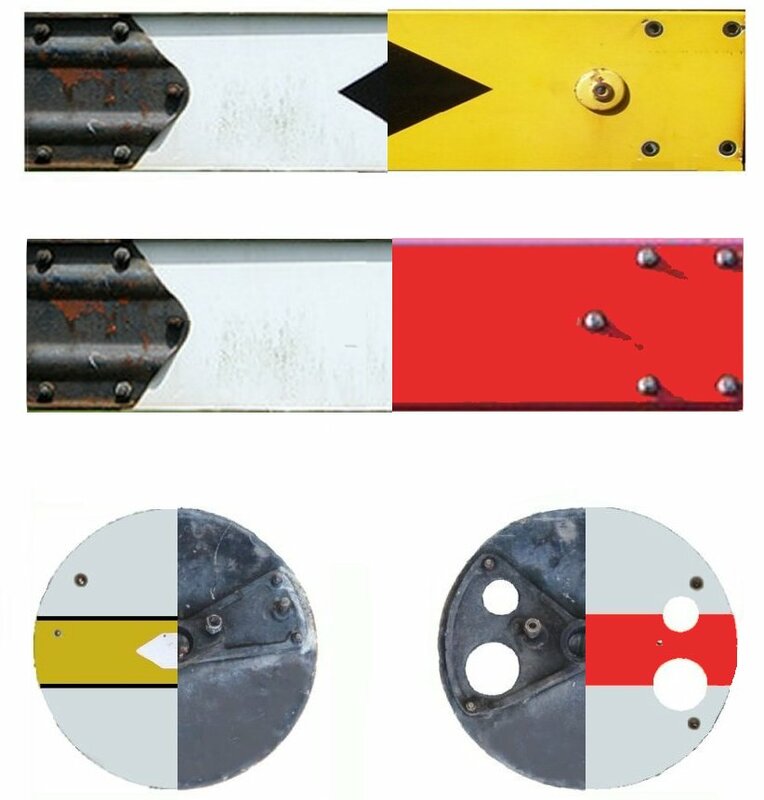 Finally, there are transfers for the signal post plates as supplied on MSE fret DS312. I would suggest the best way to assemble the 'D' plate would be to paint the plate white and then cut out the letter 'T' and apply. MSE etches do not feature the bolts that secure the arm, and as these transfers are created from actual photos, the bolt heads are reproduced. A standard (unweathered) arm is provided in multiple, together with a selection of weathered arms. If modelling the LMS, the method of manufacture was updated sometime before 1935. The earlier steel arms were described as being made from vitreous enamel, and, according to a drawing I have seen which was issued by Derby on 9 January 1935, these were fixed with a large cast iron washer, plus four bolts. The sprayed enamel arms dispensed with the cast iron washer, and, according to the drawing, were riveted to the spectacle plate. These large cast iron washers were also used by the LNE and Southern Railways, and on the Southern appear to have survived until the end of steam in some numbers. ONLY the front and back of the arm are featured - it is assumed the spectacle plate will be painted and glazed as per the MSE instructions. Payment via our secure shopping kart or PayPal - you can choose which you prefer once you have entered your details. Transfers will be posted as soon as your payment is received. 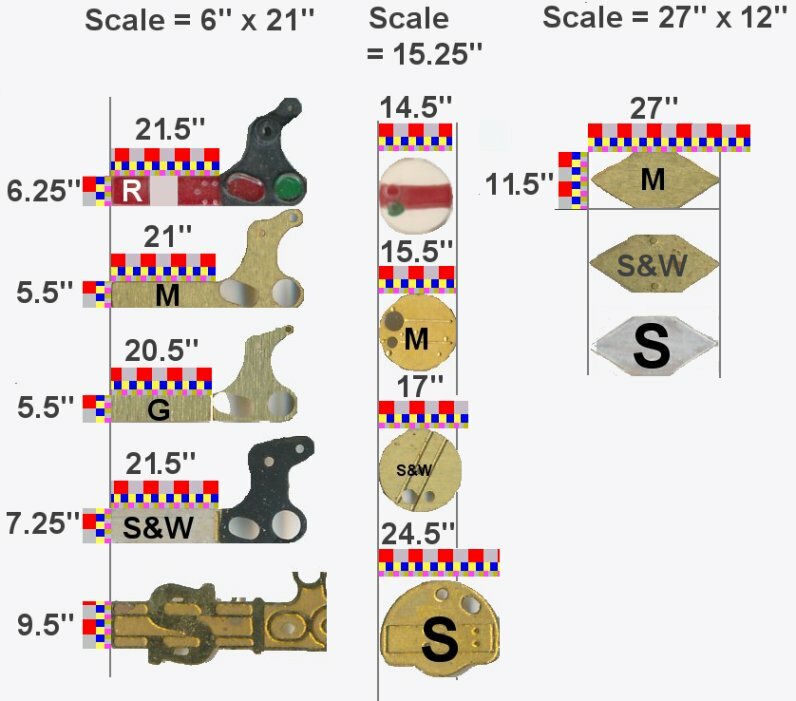 See below for a comparison of the 4mm Upper Quadrant arms available and their suitability for true scale models. Which scale 4mm Upper Quadrant arm is closest to scale? Having produced a set of transfers for standard Upper Quadrant arms for the MSE etched arms it wasn't long before people started asking what other makes they might fit, and what 'scale' might actually be. The actual dimensions taken from my own prototype arm is 41.75 inches wide by 10.25 inches tall. That is for the arm only, and excluding the spectacle plate. On the left are a set of scans of common makes, and their full-size prototypical dimensions. Only Ratio and Scaleway get close to the correct height, with Scaleway spot on at 10.25 inches. The Scaleway arm is marginally too long, but can be trimmed to obtain the correct scale length. So with the detail filed off and the length adjusted, Scaleway is actually the most accurate arm. Scaleway also provide a considerable number of arms on their fret, so also win in the 'value for money' stakes. However, this is a Southern Railway fret, so the disc signals, etc. are specific to that region. The Spratt & Winkle full-sized arm is good in terms of overall dimensions, but the etched bolt is clearly wrongly located. The arm can therefore be used if the detail is filed off. It's also worth noting that the S&W arm also features the large spindle boss which I believe is unique to the Midland Region. The Gibson fret features a separate arm and spectacle plate and this allows the arm length to be adjusted if a short arm is required. These 'shorter than standard' arms were used in locations where a full arm would be within the loading gauge so would strike passing vehicles. However some such arms appear to be shorter than others, so the Gibson arrangement allows great freedom. The Liverpool-bound starter at Aintree Sefton Arms was a case in point, where space was so restricted the S&T people just used the spectacle plates without any arms at all - which can be done perfectly with the Gibson fret. In summary, all the frets are basically sound, and will make a good looking model. The missing inch does nit show in practice, and personally I tend towards the MSE and Gibson frets. I will repeat this exercise with the shunting arms and discs as there appear to be greater variations, with the Spratt & Winkle shunting arm being noticeably too high. However, these transfer sets were designed for the MSE fret, and so will require some fettling if they are used with other arms. However, I have successfully used them successfully recently on a set of Spratt & Winkle arms by using two transfers to adjust for the greater width. 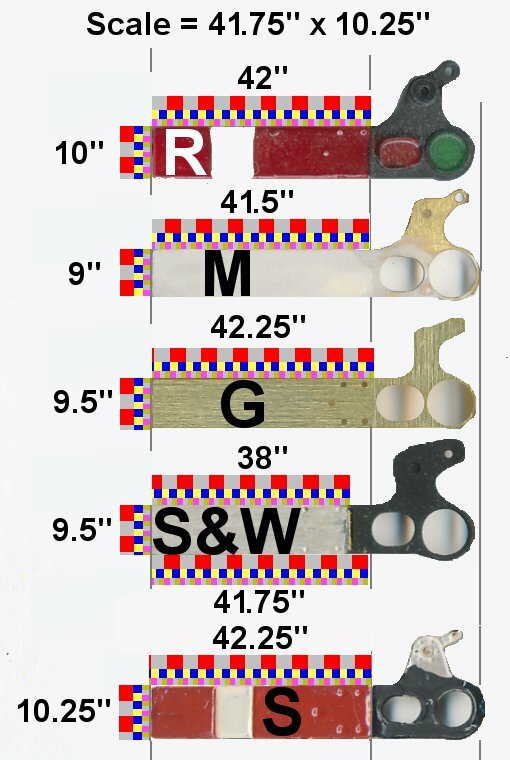 4mm scale LMS brass etched shunting signal arms, discs and diamond plates from Ratio (plastic), Spratt & Winkle, Alan Gibson, MSE and Scaleway compared.